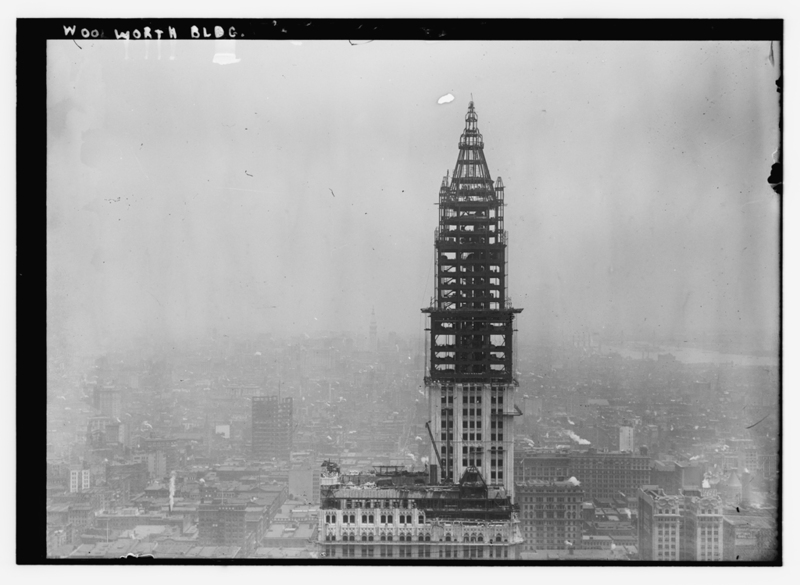 The Woolworth Building tower under construction, July 1, 1912. Photograph by Irving Underhill, Library of Congress. 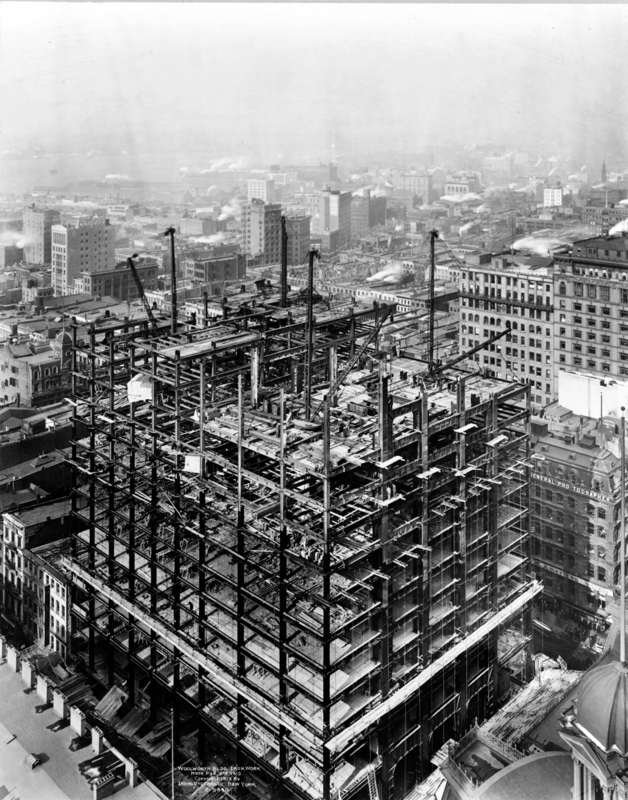 Detail of the steel skeleton under construction, 1912. Photograph by Bain News Service, Library of Congress. 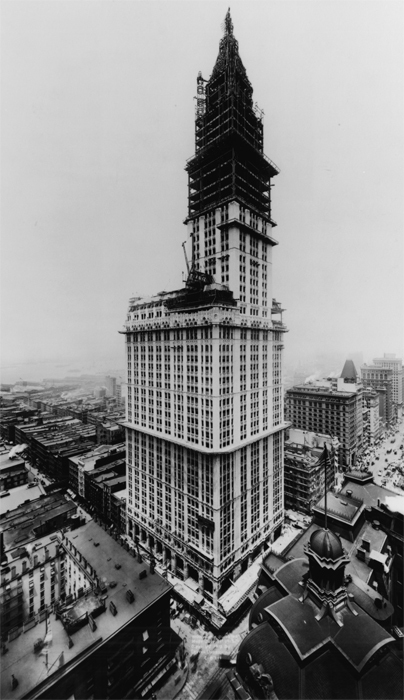 Construction companies such as Thompson-Starrett and The Foundation Company commissioned photographers to take progress photographs that documented their work. These images illustrate key elements of the engineering and construction of the structure. This view across City Hall Park shows that the attachment of the terra-cotta façade to the steel frame began before the completion of the limestone at the building's base. This allowed the construction crew access below the sixth story for receiving the terra cotta, stone, and brick that suppliers delivered continually to the site. It also prevented damage of the more detailed ornamentation in limestone at the lower floors. Safety nets hung from the building every 15 to 20 floors to catch errant debris from construction and to protect passers-by on the sidewalk, as seen in the top right image. This news agency photograph of the upper portions of the tower shows the details of the steel frame. At the corners, diagonal knee braces form K-shapes, as shown in Aus's drawing on the previous page. 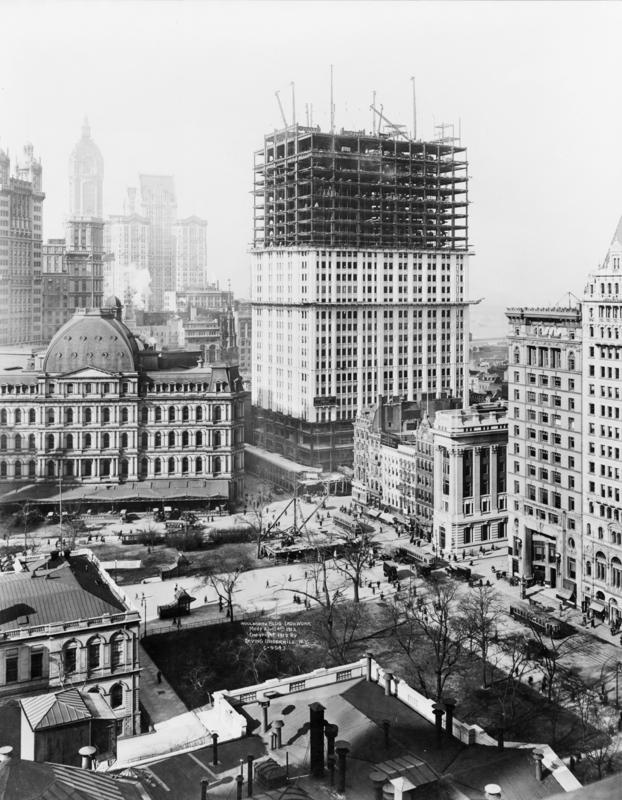 Erecting the steel frame of the Woolworth Building, view from City Hall Park, April 4, 1912, Photograph by Irving Underhill, Library of Congress.